WOW, Astonishing performance by u yesterday. That single bit combination songs was very beautiful. Hats off for ur performance. I liked it very much. Thats a very nice rendition. Superb!! The Feel and Music mattered here that I feel. This is one way and also an example for national integration. Could you give the meaning of this "Apne" that you have sung here. Thanks for sharing such a nice video & music. Its excellent. This girl looks like one contestent of Airtel Super Singer 2008- Thamizagathin brammandamana chella kural thedal. I was so upset that Baargavi was eleiminated, she didnt perform well because of wrong song selection. You could have given her a chance to sing some other song. i m unable to see this video due to some tech problem..
Udhaya..Udhayaa.. is one of my favourite. You were great to listen as always.. Superb. I love the Udhaya song. Wonderful composition by Rahman Sir. Thank you. Raj: The Hanuman chain was NOT given by me. I guess there is a serious misunderstanding. If you had seen the earlier episodes, Santhosh mentioned during the regionals that his mom gave it to him and he thinks it is lucky for him. And he carries it. It has been my routine to ask time and again whether he has it on his person. Wish you had made double checked before calling me biased. This is like listening to MY Chinamyiii after a loooooong time..
your singing at Time code 01:09 to 01:11 and 01:20 to 01:21 ..its like I'm caught in some spell. The songs were blended at the right place and beautifully rendered by you! WISH U A VERY HAPPY DIWALI CHINMAYI..
Just curious..Do u always close your eyes when you sing/perform..
hi miss chinmayee..im from singapore..your a very good singer and very famous in singapore..you must be very proud to be quite regular in a r rahmans songs..hope you soar to greater heights and be a living legend..hope to recieve a reply from you in your blog..
that was really good. It's one of my favorite songs too. 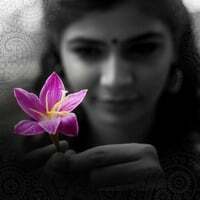 hi Chinmayi!how r u?really nice video,love that song.i have been going through ur blog many times and save it in my bookmarks.i just love reading ur writings here and of course like ur voice so much.i sent u request in fb too but no response.hope to hear frm u.hope to hear more and more songs frm u.congrats! Sorry about that. may be my kid didnt listen to it properly, neither me. we didnt see the earlier episodes as well. Sorry again. But I must tell you, its a great work that you have been doing. Singers improving at every stage, and the competition is getting more tougher and interesting to watch. Hey by the way a request, we love hearing SAHANA song from you live - if you get a chance, do sing it for us in one of the episodes. I m unable to access ur pictures and music... how can i get an access for that? This is Venkat from Bangalore. I do regularly watch Airtel Super Singer 2008. Commenting on ur voice I shud admint that u have a very bold, clear & a very soothing voice which u render according to the song. Also Tamil pronounciation is too good while singing which really can make a song Hit. Thats really great. Moreover I'm a die hard fan of ARR sir. And liked ur voice since Kannathil muththamittal. All the Best for ur future ventures. I hope u reply my comment. Just a question. Since most of the celebrities are busy, how do you get time to blog n reply to our comments. I listen to this song in one of your posts sooooooo many times.Its awesome and very soothing. Thank you so much for sharing this video. Happy deepavali to you and amma. One request...if it is possibe...could you please recommend Vijay TV to retelecast Super Singer show during the weekend please????????????? We love to watch Super Singer and you are a very good compere. Just a thought - Can you also say Shubha ratri - Meaning Good Night in Sanskrit (phonetic language) at the end of the show? It feels good for your fans including us. Have a question for you: In Super Singer 2008, I hear this word often - "different jonar" for different song types. Can you tell me what "Jonar" means???? Unnale... thannale... ennaalum... chinmayi.. chinmayi... ularugiraen !!! An awesome blend of the two songs! Keep rocking! Looking forward to see your song & dance in Vijay TV. Mayyaa myaaa song, in airtel super singer non tamil langugae song round. Wow, I liked your singing that day, it was a very good rendition. I been wanting to write and congratulate you on your tremendous versatility on this song ..especially.. the layam that you brought in the nelivu in the song..un paadhi en paadhi.. vow. can't stop appreciating you. thank you for such wonderful titbits... in Airtel super singer.. I am in bangalore and I regularly try and episodes... best wishs.. meenags..
hai chinmayee its fabulous and mind blowing why can,t you sing some traditional songs too. Can't believe your rendition of Udhaya Udhaya..can't even enjoy the original after listening to you :) Do you have a recording of the full song anywhere? Would love to hear this masterpiece in your voice! !